Description: The Lady Luck is 324 ft. long, 50 ft wide tanker that rises to nearly to 60 from the surface at her mast. 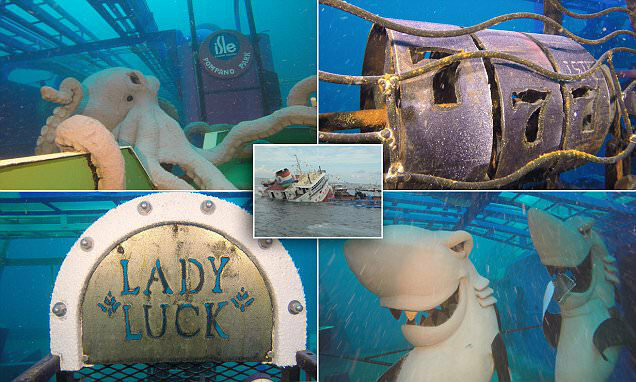 You will notice on your descent the Lady Luck logo on each side of her stack, welcoming you to the world's first underwater casino ding ding ding ding! Artist Dennis McDonald has created a larger than life size casino on the deck with octopus dealers, slot machines and card sharks alike. You can swim down find an open seat at a table and gamble on a great photo opportunity. Be careful your dealer may be a little fishy! The ship's web of pipes and structures makes for a great fish haven and back drop. Stop by the bridge for a panoramic view of the ship. History: Lady Luck, formerly known as the Newtown Creek, was built in 1967 by Wiley Manufacturing Company. She operated as a sludge tanker or more affectionately known by New Yorkers as a "Honey Tanker" for nearly 50 years. She would move sludge from plants in New York without dewatering facilities to plants with dewatering facilities that would convert the sludge into fertilizer pellets. The Newtown Creek was decommissioned in the summer of 2014 and put up for auction by the City of New York. On March 1, 2016 Ship Wreck Park Foundation of Pompano Beach purchased the New Town Creek from NYC, thanks to generous donations from the Isle Casino Racing and the City of Pompano Beach. After several delays, on April 18, 2016, the ship was towed from NY arriving in Miami on April 24, 2016. She is currently being cleaned and prepped for sinking off Pompano Beach on July 23rd, 2016. Stop in today to reserve your spot before they are all filled. Don't forget to reserve your tanks and equipment too!